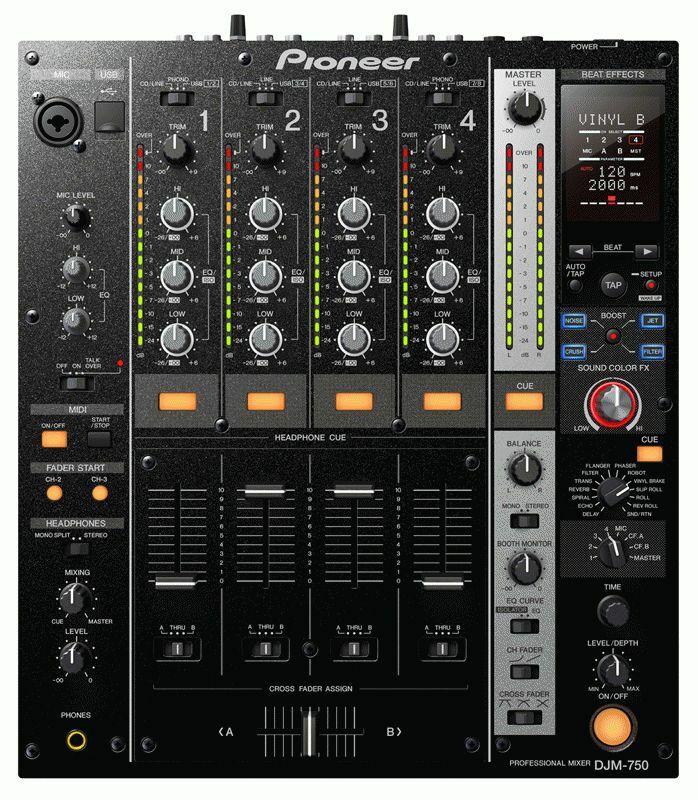 Pioneer Electronics (USA) Inc. Professional Sound and Visual Division continues to offer DJs of all levels the ability to create a wide spectrum of music and mixing arrangements with the introduction of its new DJM-750 4-channel digital DJ mixer. Offering superior sound quality and a professional control layout, the feature rich DJM-750 includes a built-in high performance USB sound card and the industry’s first1 Boost Color FX feature, which enables users to change the intensity of various effects with the rotation of the built-in effects knob. 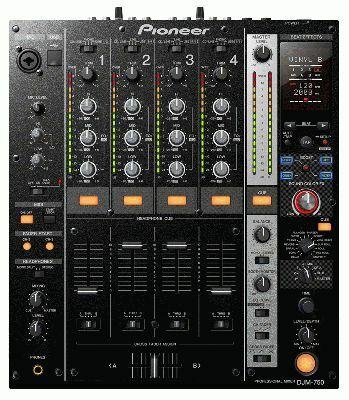 “Pioneer has always been about designing DJ products that encourage users to explore their creativity,” said David Arevalo, senior marketing manager, Professional Sound and Visual Division for Pioneer Electronics (USA) Inc. “The new DJM-750 offers endless effects with its Boost Color FX and Sound Color FX features. · Boost Color FX – The new Boost Color FX enables users to change the parameter of an effect with the varying rotation speed of the integrated controller knob. The degree of the selected effect is intensified (i.e. increase cut rate) the faster the knob is turned. The Boost Color FX knob can work on any of the integrated mixer effects and the feature includes four different types of effects, Filter, Crush, Noise and Jet. · Sound Color FX – The Sound Color FX offers four types of effects (Filter, Crush, Noise, Jet) for more creative mixing options. Users also have the ability to switch between Sound Color FX and Boost Color FX to match the music playing. · Beat Effect – The Beat Effect function presents 13 different types of effects (Delay, Echo, Spiral, Reverb, Trans, Filter, Flanger, Phaser, Robot, Vinyl Brake <new>, Slip Roll, Roll, and Reverse Roll) that can be combined with Boost Color FX and Sound Color FX to create more than 100 types of effects for extremely original remixes. · 24bit/96kHz High-Performance USB Sound Card – The DJM-750 4-channel digital DJ mixer is designed with a built-in USB sound card that enables simultaneous input-output of stereo signals for up to four inputs/outputs2 with no deterioration in sound quality. The sound card supports three different sampling rates (96kHz/48kHz/44.1kHz) and ASIO/Core Audio standards, ideal for DJ play and music recording and production. USB port, located on top of the mixer, enables quick connection of devices. The signal output path from the mixer can be easily modified using its setup tool via a computer3. · Sound Quality Design – The mixer produces clear and powerful audio using high quality components such as a 32-bit digital signal processor (DSP) and SEND/RETURN circuit parts, as well as a low-jitter crystal oscillator installed in the clock of its audio circuits, to deliver the most precise audio signals and accurate audio reproduction. 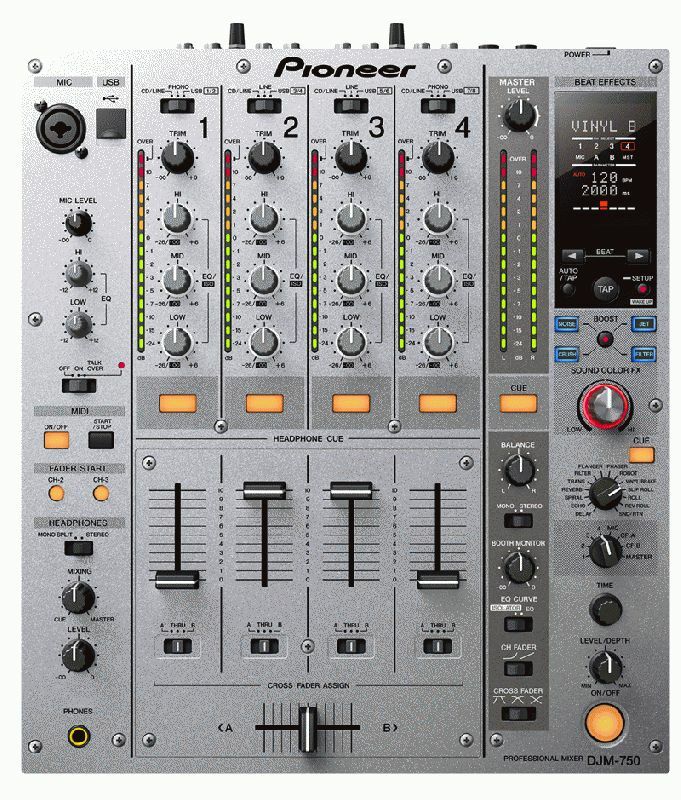 Information from operation of the device's knobs and buttons is transmitted to external DJ software and effectors, etc. as a MIDI4 signal, with a “Full Ensemble MIDI” function built in to enable simultaneous control of this device and other external devices. Each channel is equipped with a switch-type 3-band equalizer (+6dB to -26dB) and 3-band isolator (+6dB to -∞dB). Channel fader knobs and cross-fader knobs offer a “P-LOCK Fader Cap” applying a lock function to guard against accidental disconnection of knobs. · Auto Standby automatically senses active operation and the presence of input signals, switching to standby mode when a long period of input is not detected. The DJM-750-K (black) and DJM-750-S (silver) are both available in June with a suggested retail price of $1,199.00.